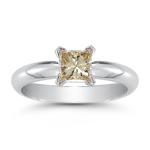 0.54 Cts Brown Diamond Solitaire Pendant in 14K White Gold . This fascinating Brown Diamond Solitaire Pendant displays a SI quality princess-cut Brown Diamond designed in prong set in 14K White Gold. Approximate Diamond Weight: 0.54 Carats. This classic pendant comes finished with an 18 inch 14K White Gold Singapore Chain.